Imagination Playground, LLC, creators of the breakthrough Big Blue Blocks that have captivated schools and family centers worldwide provides its first update on its recently launched Gift of Play program. Gift of Play! 4 Million More Kids Playing! 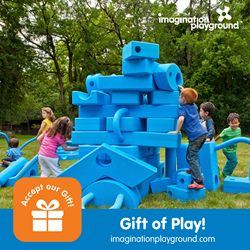 For the third consecutive year, Imagination Playground launched Gift of Play – which recognizes that every school and family center that wants the big blue blocks for their children simply cannot afford them. 1. A Community Gift - at the end of this calendar year Imagination Playground will gift a 105 Big Block set to any school or organization that collectively casts the most votes. All parents and educators need to do is follow the link –http://www.imaginationplayground.com/promotions/gift-of-play.html – to cast their own vote and rally their community to vote as well. 2. Fall & Winter Savings - through year-end Imagination Playground offers everyone its lowest prices, on all products – which is backed up with a promise and a guarantee that no offer will be refused. Imagination Playground President & CEO, David Krishock stresses how important Gift of Play has become to those schools, family centers and organizations interested in bringing child directed, creative based play to their kids. Krishock says, "Each year during back to school we begin getting calls asking if we are bringing Gift of Play back for the coming Fall & Winter season. This year, so far over 400 organizations have contacted us about our Gift of Play program." Krishock continues, “I believe everyone is excited to help us reach our annual goal of getting 4 million more children playing with Imagination Playground this year. And, everyone is interested in taking advantage of our lowest prices of the year – making Imagination Playground much more affordable." Since the Gift of Play program began in September Imagination Playground has delivered dozens of playgrounds at more affordable prices. Dr. Diane Jackson-Schnoor, Lead Educator at the Shenandoah Valley Museum in Winchester, Virginia says, “We believe strongly that children learn through play. Imagination Playground has been on our dream list for several years as something we really wanted to add to spark curiosity and ignite learning for our visitors. The Gift of Play program allowed us financially to make that dream a reality." Anyone interested in knowing more about the mission of Imagination Playground and the goals for Gift of Play should contact them at 678-604-7466 or email them at contactus(at)imaginationplayground(dot)org. About Imagination Playground, LLC, Imagination Playground is a breakthrough play space concept developed to encourage child-directed, creative free play. The kind of play that experts say is critical to children’s intellectual, social, physical, and emotional development. Invented by architect and designer David Rockwell and the Rockwell Group, Imagination Playground enables children to play, dream, build, and explore endless possibilities. Imagination Playground finds its home in daycare centers, kindergartens, elementary schools, children’s museums – and nature, discovery, and science centers, camps, community centers, children’s hospitals, hotels and resorts, public parks and more – in North America and over 70 countries worldwide.